Twist's unique talent for creating innovative new balloon designs draws crowds wherever he goes. Able to make anything while engaging crowds with story's, jokes, and magic .Twist's Balloons are great for any size event both indoor and out. Amazing job for 4 year old birthday party! Twist was amazing! 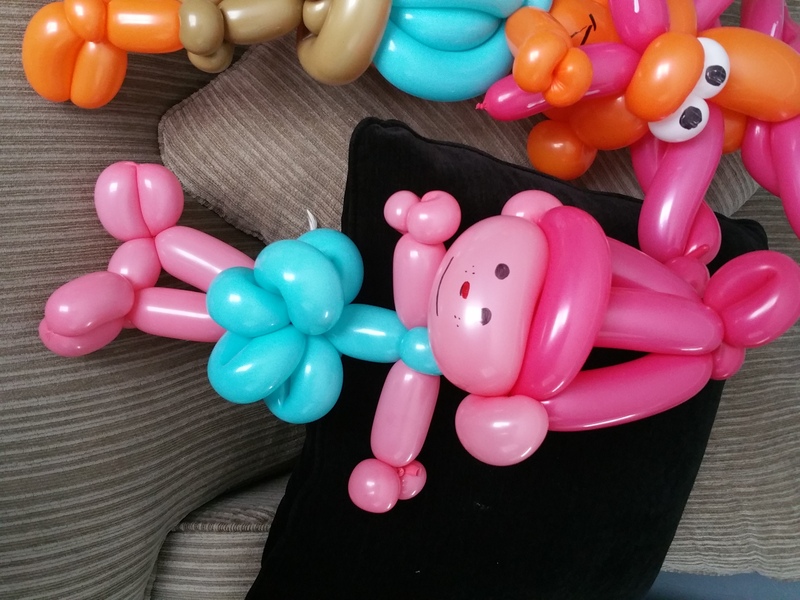 I’ve never seen such detailed balloons, and he entertained a group of 1-8 year old's amazingly! He was wonderful! Would definitely use him again! The kids loved his balloons (best I have ever seen) and magic show. Great job! Great job! Would hire again! Twist was AMAZING! He showed up to our event on time. 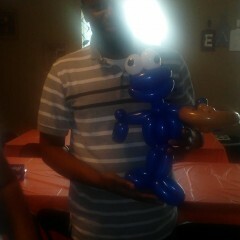 The kids loved his balloon creations. Will definitely hire him again. 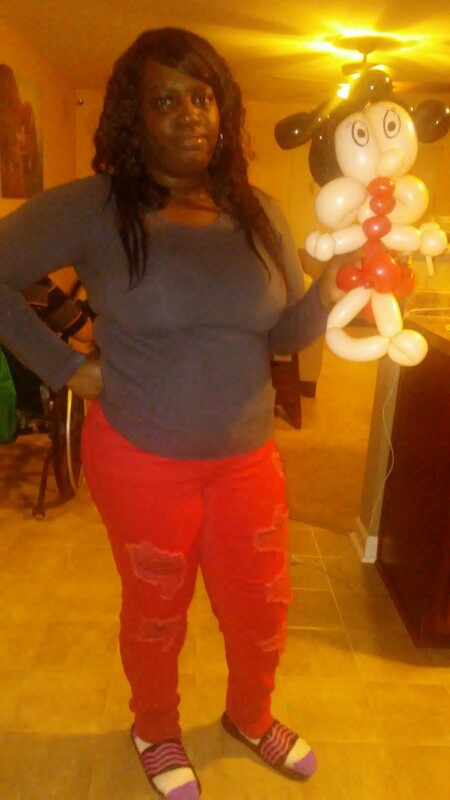 Twist the balloon man did a superb job!! Not only did he make outstanding balloon art for all 24 kids at my party he also did a super fun magic show for them. He jumped right in and was great enteracting with the kids and their parents. He truly exceeded my expectations. I will definitely be getting him for our parties in the future and many of my guests have requested his information to hire as well. I highly recommend him!! Thank you for making my daughters party a success!! Twist was awesome!! He interacted well with the kids and parents he was wonderful and I will be booking him again! Awesome Entertainer! Super Professional and Captivating. We booked Twist for my 5 year old son's Birthday party. Twist showed up early, set up quickly and professionally and really went the extra mile with some specific requests from my son. We had watched Twist's youtube channel and became familiar with some of his magic tricks and balloons. He accommodated my sons request to do some of the tricks my son loved from his videos. The tricks were even better in person and he had EVERYONE captivated. The adults were laughing as hard as the kids. The kids were totally amazed and engrossed in the show even at ages 4 and 5. He even used audience members (kids) in some of the tricks. My kids purchased magic sets on their own after the show at Toys R Us because they had so much fun helping Twist in the show. My son's Birthday is in early July and it was so HOT outside. Twist never complained in the sweltering heat under the outdoor tent we provided. He was amazing and so worth every penny. Many parents asked for his card after the show because their kids wanted him at their party too. We found out that Twist also does events for the Carolina Panthers and more. He is a gifted artist and humble. #1 coolest thing though was his balloons. Watch his videos! His zombie is so cool and his princesses are amazing. He made my son a Lightning Mcqeen for our Cars 3 themed party and an insane looking alien for my nephew. Twist your rock. Thanks again! Twist The Balloonman had children and adults smiling at his wonderful balloon creations. Thanks Twist! 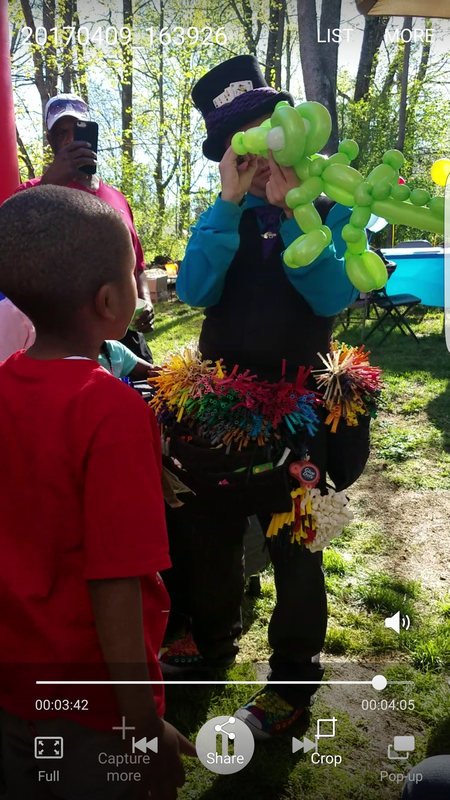 Twist the Balloon Man was hired for my 5 year old's birthday party. He was punctual and kind. His magic show was funny and interactive. The balloons were adorable and he made one for each child. He is very talented and I would highly recommend! Twist the balloon man was great. I would definitely book him again. Twister was awesome! He was very entertaining, kind and fun!! He made my daughters 4th birthday one to remember for a life time! He is truly amazing and kept all us engaged the entire time! He is an artist and is so talented. My family and I are so grateful for the exerpience. I booked Twist last minute for a party, he was on time and a a pleasure to work with. 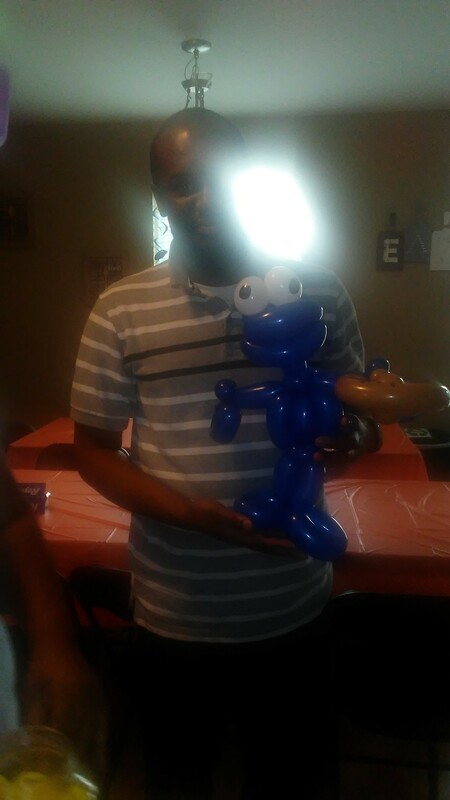 He came to my daughter's First Birthday Party and everybody LOVE it. He was so awesome and so very creative in the balloons he made for all the kids. The price was very reasonable and very child got a balloon of their choose. I would recommend him to anybody! 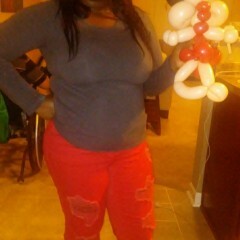 Best Balloon Artist Ever !!! 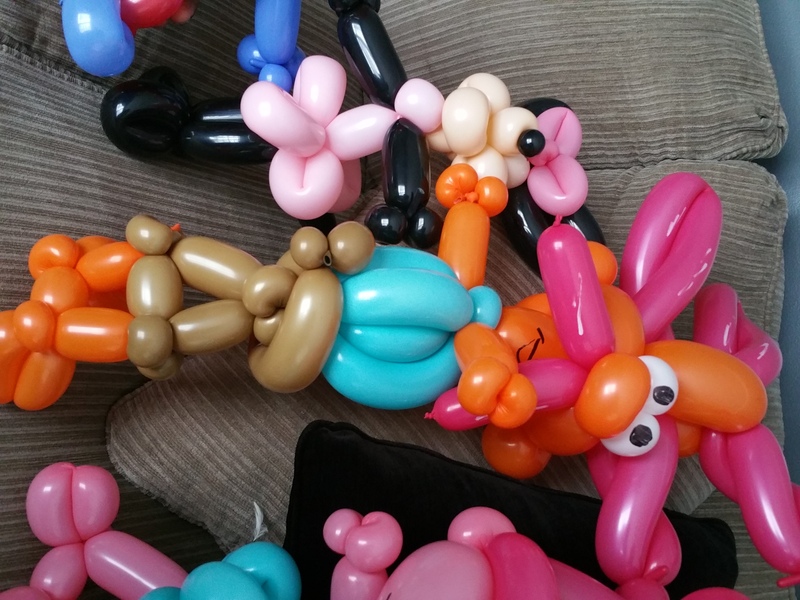 Dylan blew the parents and kids away at my sons 4th birthday party with his creative and excessively detailed balloon animals and characters. Multiple parents came to me and Dylan to praise him for his great personality and amazing balloon creations. I plan on booking him for my sons Party next year as well. I have asked for his services for several occasions and have been so pleased every time! From my daughters birthday party, to a church function...everyone was so happy he was there!!! Very easy to work with and always puts a smile on people's faces! 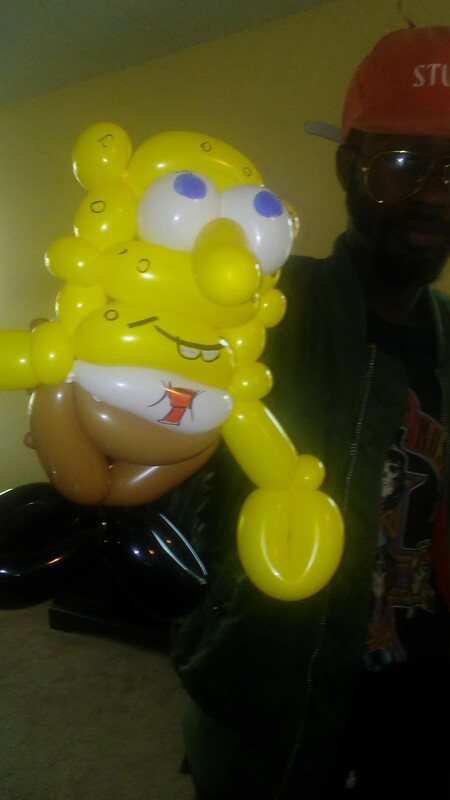 This guy is truly a balloon artist, He has a talent that is so unique, unseen before, in am happy to have him at any event! If you pass him up, you are missing out! Twist the Balloonman is Awesome! 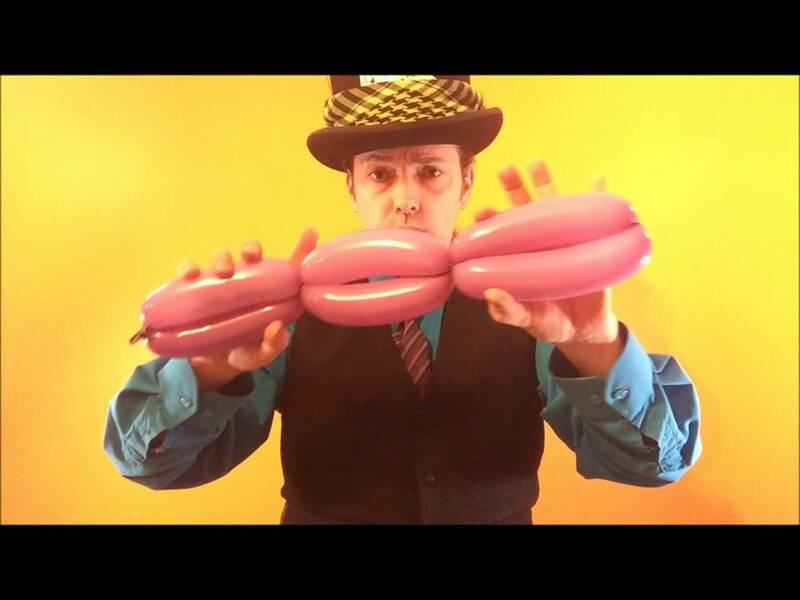 Twist the Balloonman has entertained our customers at three of our restaurants over the past four years on a weekly basis. His professionalism, energy and entertainment is outstanding. He draws a crowd whenever he performs. You will not be disappointed! We booked twist for our annual event and he did not disappoint. Some of the balloons were amazing and he was able to pretty much make balloons for 50 kids that day and do it all timely. The Santa balloon was amazing and some of the detail is incredible. We also asked him to do a few other things that had him leading the kids and he gladly helped us with a smile. We look forward to future events with Twist! We booked Twist the Balloonman for my daughter's first birthday party. It was a wonderful experience. He was easy to communicate with, arrived on time, made anything the children wanted and was very pleasant! We had nothing but compliments from our guest. In fact, several people have already asked for his contact information. We would most definitely use him again! Twist The Balloonman came to my Daughter's birthday party. I did not need any other entertainment. He captured the children's attention and interacted with each of them. They each took home a "souvenir" of balloon animals, swords, dogs etc. We had a great experience with him. He was very pleasant. He listened to the kids and their stories of why they wanted "that dog". I would definitely recommend him to any parent that wants a one stop shop full of surprises. Made MAGIC at the birthday party! 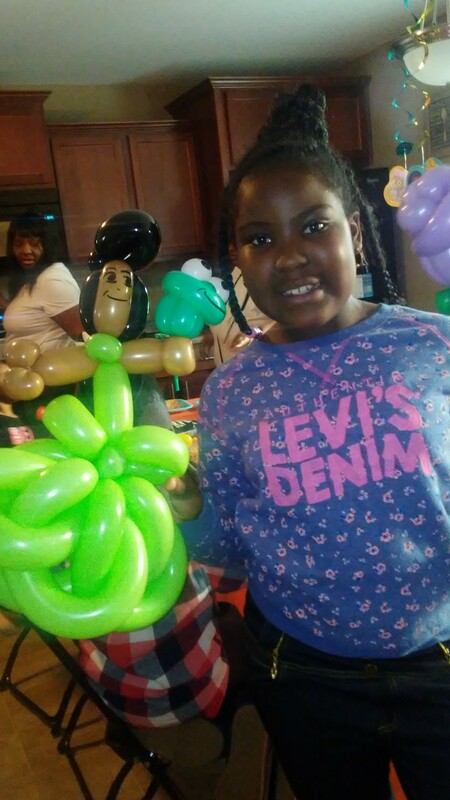 My family and I had Twist the BalloonMan at my niece's 8th birthday party, which had a magic theme. He did double duty, first by making balloons for all the kids (and adults too!) and then by putting on a magic show. 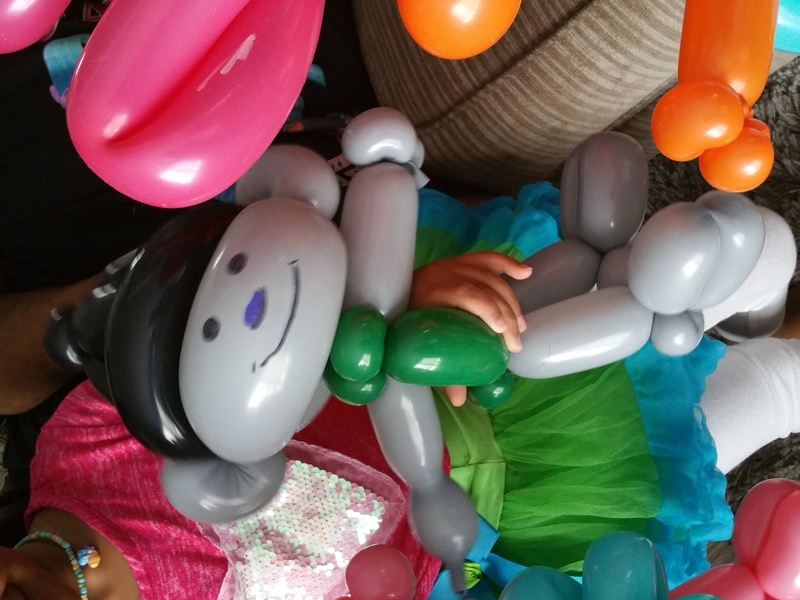 He did a great job of making balloons that fit the kids' unique interests and then including them all (even the shy ones!) in the magic show. He has great patience and a flair for fun. It was a great choice - my niece LOVED her party. Thanks, Twist! Twist is great with the kids (and adults)!! Twist has a great sense of humor and is a real gentleman. I like the way he listens to kids, is always respectful to both kids and adults, and gives his best to what he does. He helped make our party a fun event for everyone there. 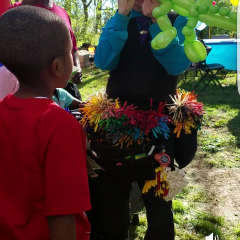 Yancey Street hired Twist the Balloonman to work our Fun Day activities and he was so well liked for the event that the kids demanded that he return for the next three events. His skills with the kids is exceptional and the adults loved it. My husband and I had twist come to our wedding reception, why a wedding reception? Well between our cousins, and friends of our families we had 17 children under the age of 12 at our reception. Twist was a great addition not only for the children but the adults. They absolutely loved him and we're shocked when the requested something they thought was outrageous and could not make, but he did. We also didn't have a cake or our reception, just cupcakes because we had a cake reception following our ceremony. Twist created a really neat and quite accurate cake with my husband and I on top, including the detail of my husbands beard, the color tie he wore as well as the rest of our clothes. We are excited for God to someday bless us with children, because we will defiantly be hiring him for our children's birthday party's and other events. We had Twist at our company family day. He was a big hit with the kids. No one was disappointed and would recommend him for any event. We have booked him for several events here at the Club and every time people are amazed at the things he can make! There is always a line to get a balloon, and he is always so great with all of the kids. I would highly recommend him for any event. Prices are reasonable and well worth every penny! We had Twist at our home for our daughters first Birthday party. He was a hit with all ages. I would hire him again. Twist the Balloonman is the best. We had him come to our son's 5th birthday party. Twist is always professional and great with the kids (and adults). 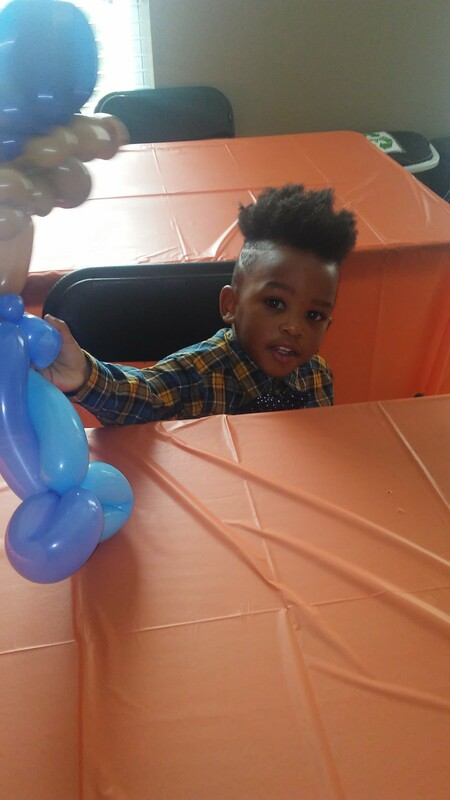 This guy done my grandbabies 3rd birthday party and the kids loved it! his talent is someting little ones these days have never seen and they were amazed. He was so cool with the kids....I highly recommend him if your looking for entertainment. I thought his work with the balloons was amazing myself. The adults loved it as well. THUMBS UP! when I 1st Seen Twist Online,it Brought Out the Childhood In Me,I ask Him Could He Make a Specific Mascot For My Favorite NHL Team,and And a Very Short Time Later,Replied Back to Me With The Most Awesome Pittsburgh Penguin Mascot I Could Have ask For,a True Professional,and True to His Word. Twist has made 2 of my daughter's birthday parties so much fun! The most recent was her 4th birthday. We had planned on a pool party but the weather was horrible!! I messaged twist the night before the party to see if he could do some indoor entertainment, and he squeezed me in! Totally saved the day!! Based on some of his fantastic reviews here in Hickory, NC, we booked Twist for our employee appreciation event. The children loved him, his creations are wonderful and the parents were very complimentary. We would book him again in a heartbeat! 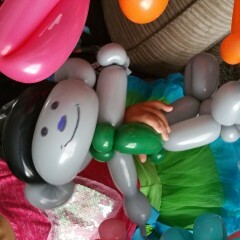 Twist was the perfect addition to my two year old's Sesame Street themed party at our country club! Professional and artistic. Twist the Balloon Man is highly professional and wonderful with children. He is accommodating to everyone that attends his events, and takes pride in his work. I highly recommend him for your next event!!! He is great with kids. We went to one of his local apperiances for my son's birthday and he made my son feel special on his birthday. Twist was punctual and very experienced, we had never had a performer at a party before and he guided us so that it all ran smoothly. He was very patient and kind to the children; they loved him. A very good first experience, would highly recommend! Twist The Balloonman has been hired by us, at Chick-fil-A of Boone, many times for our family events. He gives 110% for the kids. The kids and adults love him! He is extremely creative, talented and an excellent entertainer. I would highly recommend using Twist for your next event. He makes WHATEVER your kids ask for!!!! Super FUN! When my children see Twist, they always try to "stump" him with a challenging creation...but they've never been able to find something he couldn't make. He's great with the kids and very funny. 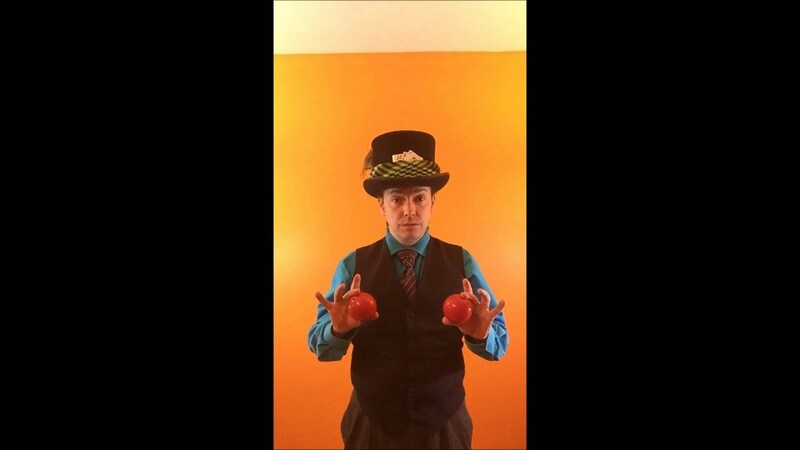 We had heard great things about Twist the Balloon Man and booked him for the July 2014 Grand Opening Celebration for Sisters of Mercy Urgent Care in Weaverville. He made everything from a pirate to Lionel Ritchie! Wonderful. Affordable. 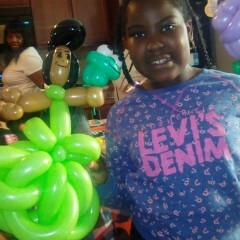 Stayed until the last guest had their balloon creation. Highly recommend. He has done several events for me including my grandmother's birthday party to individual balloons for sick relatives needing a 'pick me up'. 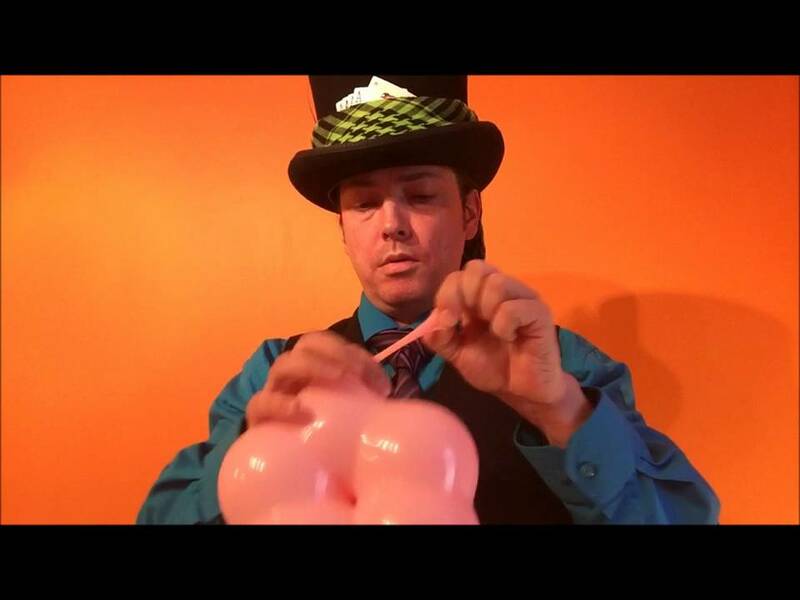 He has incredible talent, amazing balloon art, entertaining magic shows and a great personality. Everyone has only given praise when I have gotten him to do an event for us. 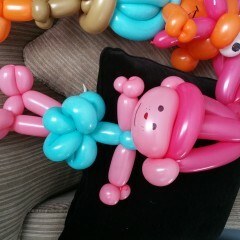 Twist The Balloon Man did an almost life sized fisherman for my friend's sick child. He loved it and we were all very impressed. Thank you for making his day. 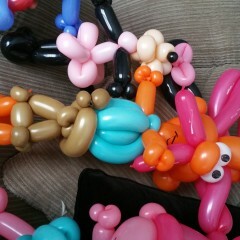 Dylan is by far the best balloon artist that i have ever worked with. He is very professional and the children love him! ! Dylan is a delightful and talented soul! We have known him for over four years now as Twist! He is patient and kind with children and genuinely enjoys bringing a smile to their faces. Four years ago, my daughter screamed at the mere sight and sound of balloons. Twist's kindness, patience, and talents won her heart over with time. She always hugs him when she sees him and even helps him make balloons. Dylan's kind heart is in each twist of the balloons he makes. Thank you! Great artist. The children all love his work. Definitely recommended!!!! He is the best ever!! Super talented, the kids at the party was in a star gaze at him & the grownups were too!! Highly recommended!! 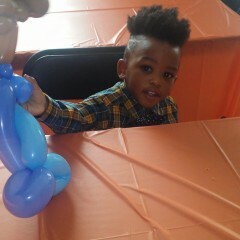 I had Twist come for my granddaughters birthday party. There was 3 girls that was 4 years old and 4 teenagers. The girls loved him and the balloons but the teenagers all wanted Twist for their birthdays. Twist was talked about for weeks! Thanks for the awesome job! I've seen Twist work with children and families for several years, under various circumstances, and find him unfailingly kind, professional and brilliantly creative. He doesn't just delight kids, he leaves adults astounded and amazed. He is simply THE BEST! 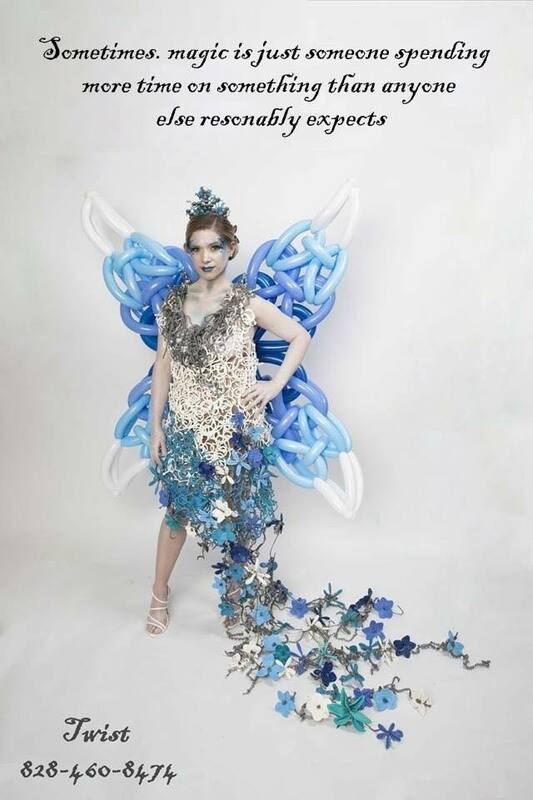 Have you seen Twist, The Balloon Man's work? He is fantastic!! I love his creativity! 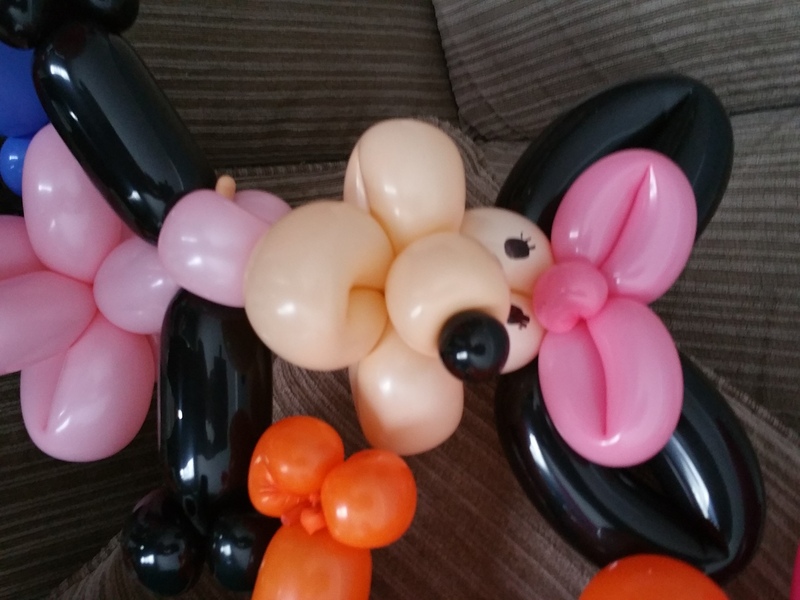 Twist has made numerous balloons for our little girl! We've seen him in action at restaurants and parties. He's great with the kids and just an all around great guy! His work is awesome! Awesome "Twist" for any party! My son absolutely loves Twist the Balloon Man. We have had the privilege of seeing his magic show and balloon art at Tweetsie and at local festivals. He interacts very well with children and has a quick wit that children and adults find amusing. 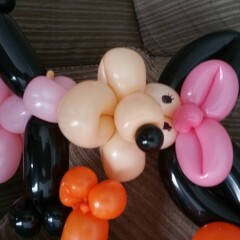 He is very talented in that he can turn a balloon into anything your child desires. He constantly engages the children in conversation while creating their balloon masterpiece. I would highly recommend using Twist for any function. For small Balloon Twisting events (Birthday Parties, Restaurants, and Festivals). Twist will wear a balloon apron full of over 3000 balloons in all shapes and sizes, allowing twist to walk around and greet your guests, talk and tell jokes while twisting balloons. This allows Twist to work in the smallest areas as well as keeping mobile. For Large Balloon Twisting events ( Festivals, Trade Shows ) Twist has a huge Craft bag that hold over 7,000 balloons in all shapes and sizes, this makes him stationery for these events, but allows him to twist for hours with out stop, he is also the only Twister that uses two pumps combined to make balloons twice as fast. Born in England, Twist spent his childhood fascinated by magic and the circus. He spent his earlier years performing in Schools, Churches and Festivals all over England and Wales. Growing up between a small town in the valleys of Wales and the big city of London Twist developed a unique outlook on life. At a young age Twist's teacher identified him as the class clown that everybody loved; if he only knew then what Twist would grow up to become. As a teenager Twist's family moved to the southwest coast of England, known as the English Rivera, where Twist learned the basics of street performing, honing his skills while performing infront of hundreds of people in the streets, clubs and at parades. Twist was then asked to try out and join an International Circus live on national Television before traveling through Europe. In his Mid-twenties Twist met the Love of his life, an American, waiting for a plane in Gatwick Airport London. The two of them dated between the countries before Twist moved to her home town in North Carolina and later on that year they were married in Tennessee. Since moving to America Twist has become a household name in Western North Carolina, first performing at local restaurants and festivals then working at North Carolinas oldest theme park Tweetsie Railroad, and then Entertaining the Carolina Panthers Fans at all of their home games and special events in North and South Carolina.